Knife Throwing, Sword Swallowing, Bullwhips, Trick and Fancy Roping, Dog Act, Fire Breathing/ Fire Eating, Electric Chair, Bed of Nails, Blockhead, Showgirl, Classic Burlesque, Fan Dance. 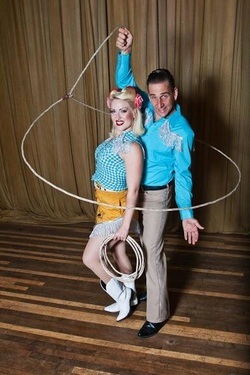 ﻿ Cowboy Trick Roping: Miss Dixie an Molotov are trick and fancy rope artists who spin lassos and amaze audiences performing up and down the West Coast. Together they perform tricks from the old west. Molotov has spent over 15 years practicing this skill and trained Dixie, guiding her to become the new thriving trick roping artist she is today. Precision Bullwhip Cracking: A symbol of control and adventure the sharp crack of the whip is a thrilling ride that will command everyone's attention. Molotov and Dixie demonstrate the power of the bullwhip with precision and force. Using only finely braided kangaroo hide whips, the the tool seems to become an extension of their arms as they crack rhythmically to music. Once they get those double whips going it sounds just like an old steam engine rolling in. Molotov loves to crack his long ten foot whip wrapping it around Dixie's body, spinning her into him for a little romance. Reminiscent of the famous Zorro, they cut flowers out of each others hands and mouths faster tan the speed of sound. ﻿America’s Favorite Performing Dog - Dually: Everyone loves watching this adorable rescue dog as he performs amazing tricks. Half terrier, half cattle dog and 100% heart, this little guy will make you laugh with his funny antics. Whether he is showing off the fancy ways he jumps through his hoop or doing a little grocery shopping with his miniature shopping cart you are gonna love his fun personality. In his cute costumes he walks the figure 8, runs the grapevine, and dances on his hind legs, even stealing Molotov's, ahem, underwear! These are just some of the fun tricks Dually does. 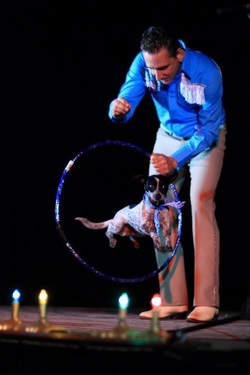 Dually loves to be on stage and audiences love him! ﻿Mysteries of the Sideshow: The bed of nails, the electric chair, the human blockhead, fire and glass eating, and fire breathing - all strange but true super human feats of mind over matter. The Bed of Nails: Molotov lays on a bed of over 500 sharp steal nails just like a fakir from the far east. Dixie stands on him pushing this pain proof man a little deeper into those nails. She bounces and pops a balloon on his chest crushing into the nails with all her weight. And for the finale, breaks a real cement cinder block on his chest, practically exploding it with the force of her 15lb sledgehammer. Also performed as Al and Peg Bundy in their salute to classic tv, "The Bundy's". A huge crowd pleaser. The Blockhead: A sideshow classic- Molotov pounds nails, icepicks and screwdrivers into his head with a hammer. Don't worry there's no blood and no pain, because where there is no brain there can be no pain, and Molotov is what they call a brainless painless wonder. Fire: Molotov performs a comedy fire eating routine, eating fire-like shish kabobs and even drinking it by the spoonful like chicken soup. He just can't get enough of that fire soup! Breathing fire is also one of his favorite past times. Featured on the TV show, "Oddities SF" as the human volcano- Molotov breathes huge 15ft flames from his mouth like old mt Vesuvius.